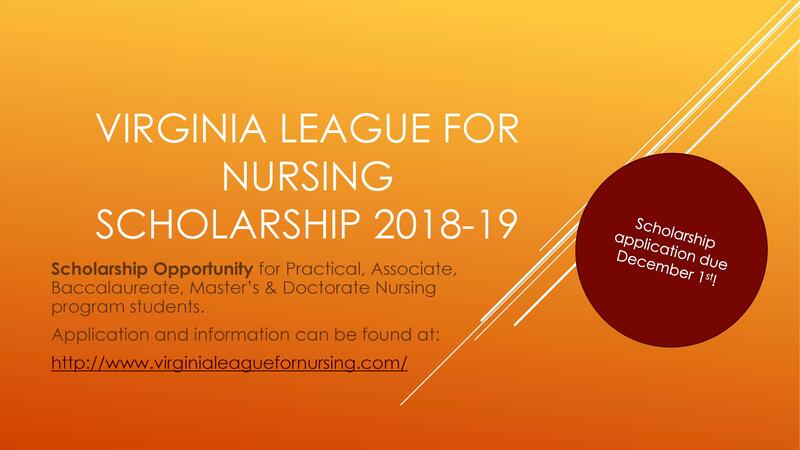 Thank you for your support of the Virginia League for Nursing. VLN continues to promote excellence in nursing education and is committed to building a diverse nursing workforce to advance the nation's health. We award scholarships to individuals who are enrolled in a program of study leading to a career in nursing or continuing their education in nursing. The Virginia League for Nursing is a 501(c)(3) organization; meaning that donations to the VLN are exempt from federal income tax. One hundred percent (100%) of your tax-deductible donation will be used to provide financial assistance to deserving individuals desiring to make a difference in the profession of nursing. Individuals who donate to the VLN Scholarship Fund will receive recognition at the Virginia League for Nursing Annual Meeting and their name will be listed as a contributor on the VLN website. We look forward to acknowledging your support of nursing education and your active involvement in our scholarship fund. Thanks for your support of nursing education in Virginia! To donate to the VLN Scholarship Fund by debit or credit card, click on the donate button.